I am so glad that Award Season is upon us again so I can play my favorite game of deciding who worked their dress and who looked a mess! 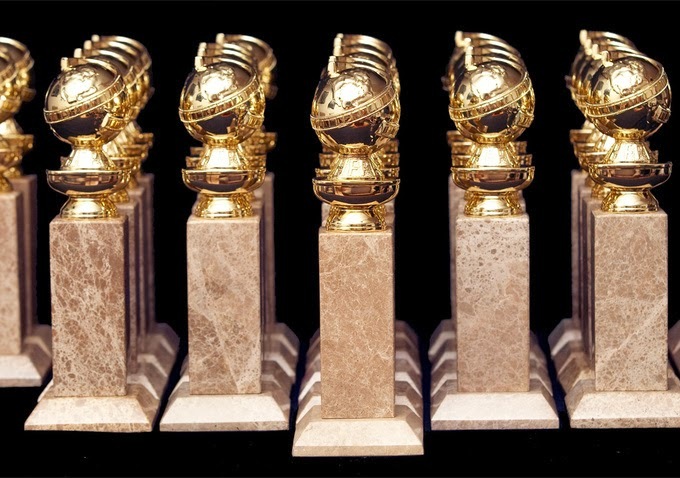 Our first stop on the major award season journey is the Golden Globe Awards. Hollywood's brightest stars came out to shine but some were a little lack luster, while others shined like Tay Swift's eyes when she sees a male celeb who has a bigger name than hers and is single. Without further ado, lets take a look at who I thought worked her dress and who looked a mess. Thank goodness for Lupita Nyong'o last night at the Golden Globe awards! The newcomer SLAYED everyone on the red carpet in this red, caped Ralph Lauren dress paired with Fred Leighton gold jewelry and a Monica Rich Kosann clutch. Lupita was the epitome of perfection last night and she won OJ&B's choice for best dressed of the night! If this is what she wore to the Golden Globes, can you imagine what she will do for the Oscars?! 10's across the board!! Cate Blanchette made my jaw drop when I saw her walk onto the carpet last night. Her entire outfit; hair, make up and dress is SNATCHED! This black lace Armani Prive was stunning and prefect for the Globes red carpet. The hair was ultra glam and helped show off her Chopard earrings. I am so glad to see that the funny ladies are stepping it up in a huge way for the 2014 award season. Leslie Mann blew me away in her Dolce and Gabbana LBD. Her hair and make up looked beyond and her small frame made that peplum pop! I am so happy to see her look so stunning. I loved seeing Sofia Vergara step away from the little mermaid dresses and into something that would make Ursula proud. I love a full gown (it must be the southern in me) and Sofia killed it in this black Zac Posen gown. At first I was a little thrown off by the huge Lorraine Schwartz statement necklace but it grew on me. The color is beautiful and I guess you need something big on top to balance out the bottom of that gorgeous gown. You all know by now that I love color but for some odd reason the black gowns really caught my fancy this season. Thankfully Julie Bowen is reminding me why color will always be my jam in this Carolina Herrera gown. It is bright and happy while remaining chic and feminine (I love the little capped shoulders). I have always been a big believer in the person wearing a garment making or breaking the look. Julie adds extra pizzaz to this gown as I am not sure if I would have loved it so much on anyone else. Excellent choice Carolina! I love a bit of glitz on a glam night and Mila gave me just that. Mila looked amazing in this Gucci gown. The top of the frock has beautiful sequins making it perfectly OK that the bottom is simple and flowy. She looked smoldering in it and her hair and make up looked excellent! I was actually really empresses by a lot of the ladies hair and make up this year. I thought that Kelly looked gorgeous in her black Escada gown with gold accents. This dress really fit her body extremely well and it made her look toned and tight. I loved the slick back short hair combined with her gold statement earrings and rings from H.Stern. Super chic! I thought Julianna Margulies looked simple and elegant last night in this Andrew Gn gown. I don't think I would have liked this dress on anyone else but again, it is all about the person and how they pull off the garment. I love the simple gold accenting and her swoop is everything. It is a very sophisticated look. As I was reviewing my selection of gowns for this post I was shocked that I picked so many black gowns. 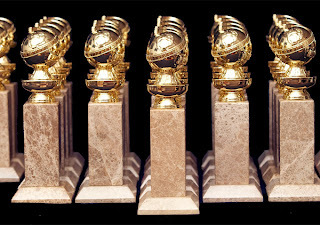 Like I said before, I LOVE color but the black dresses were a big trend at the Globes and obviously I liked them a lot. Ladies, you can never go wrong with a black dress at a black tie event. Emma Roberts looked chic in this black Lanvin mermaid dress. The fit was perfection and she looked great with the pulled back hair trend that was having a major moment last night. GURRRRRL! Zoe, what is this ratchetness?! I mean… She said on E! that her good friend Prabal Gurung thought of her when he was making this dress and told her that she must wear it. She was flattered and said that when someone says that you simply have to wear the dress. Listen, if my friend told me that and then presented me with something like looks like a high school fashion student with no talent or promise for a design career made it, I would seriously have to reevaluate my friendship with said person and/or think deeply about what I did that might have pissed them off. I mean really? Heidi, you have told everyone for years on Project Runway that "One day you are in and the next your are out." Well Boo, if you keep dressing like this for major award shows you are going to be out quicker than Lohan when the sun starts to set. This Marchesa dress with the choker and the hair just ages you and makes you look frumpy which is a hard thing to do (I thought). I love you Heidi and I expect a lot out of you. Now listen to Tim and "Make it work!" Speaking of bad retro prom dresses, this Prabal Gurung dress that Sandra Bullock wore was just not a good call. Prabal what are you doing over there in your studio?! OK, OK! I don't hate the dress that much but I think I might like to see this on let's say, a Selena Gomez. It just seems like Sandy was not owning her moment in this dress and it seemed wrong. Sorry Sandy! I love Kaly Cuoco and at first glance I thought I loved this dress. I even tweeted "Am I wrong for kind of loving Kaley Cuoco's dress?" Then people treated me like Lisa Lueder in "Romy and Michele's High School reunion." You know the former popular girl turned Vogue editor that finally speaks her mind at the reunion and says that she liked Romy and Michele's outfits? I digress... Well at a closer glance, it turns out that I might have been mixing my love for Kaley with a love for this dress. The corset looking top is all wrong and the pattern on the dress looks like when you spill that mug of water that you used to paint with water color paint on a piece of white paper. There is no doubt in anyone's mind that Paula Patton has a smoking body, so why would you want to cover it up with all of that crazy material? It looks like she took a bunch of clown collars from the circus wardrobe room and stapled them to her dress. Paula, Paula Paula! I know that you can do better! JLa, I am going to take it a little easy on you because of the awesome way you shaded Taylor Swift on E! during the red carpet but I think you can do better than this as well. When I saw it I said that you looked like a chic psych ward patient because to me it looked like a stylized straight jacket (can't you see it used that way in some Carine Roitfeld styled editorial). I just did not like it for the carpet. That's all. There is no doubt that Julia is still a pretty woman (stunning woman even) but this outfit was all wrong for the Golden Globes. This would have been fine for a nice lunchtime press event or a store opening in NYC but not for an award show. I don't always give worst dressed titles out because things look ugly, I also look at how the person wore it and if it was appropriate for the occasion. Julia wore it well but I think she wore it well to the wrong event. No T, no shade! Until next award show guys and gals!